OUR ANNUAL MAY DAY EVENT! Youth Dance (19yrs & under)- Friday May 25th from 6pm-10pm at the Boston Bar School $5 entry - music & concession. Parade - starts at 10 am, and follows the traditional route from BBESS school, down Old Boston Bar Road, then North on Hwy 1, left onto Chaumox Road, and left into Memorial Park. Boston Bar - North Bend residents will receive the 2018 MAY DAY PROGRAM in their mailboxes. Prince: Gage Campbell, Princess: Julianna Campbell, Flower Girl: Kendra Campbell and Ring Bearer: Marcus Adams. To follow the royal party intro and crowning, are the awards ceremonies (Parade & Community Spirit). The May Pole Dance will be performed by students of Boston Bar Elementary Secondary School. There will also be a Jeet Kune Do demonstration. Entertainment will be provided by the Hope Choir and Mat Duffus. 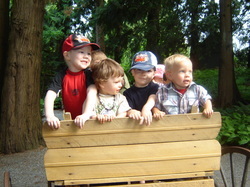 IN MEMORIAL PARK there will be fun activities for families, including Bouncy Castles, Games, and Face-painting. The Lion's Club is also hosting a food concession! A CRAFT FAIR is being held in the Boston Bar Community Hall. Table rental $15. Please contact Amanda 604-860-9352 to book a vendor table. A PIG ROAST with all the fixings starts at 5:30 pm with LIVE entertainment by "Crossfire" in the Boston Bar Community Hall! Adults: $20 Youth $15. (Beer & Wine will be available). Tickets can be purchased at Canyon Lanes, the Olde Towne Inne, Canyon Tirecraft and Fat Jack's. Seating is limited so get your tickets now! Kumsheen Rafting Trip for One. Two Gift Certificates from the Hope Garden Center. In conjunction with May Days, the staff of Canyon Tirecraft will be hosting their THIRD ANNUAL SHOW & SHINE (48075 Trans Canada Highway) on Saturday May 26th, starting at Noon(til 3pm), in their parking lot. Entry is FREE. Just bring a non-perishable food item or a cash donation which will go towards our local Food Bank. Everyone is welcome---owners of classic cars, hot rods and any car clubs are invited to come and show off your vehicles! Cops for Cancer Tour de Valley will be arriving around noon on Sunday, September 16th, 2018. They'll stop for a well-deserved rest and a nutritious lunch prepared by our wonderful community volunteers. The emergency personnel that sign up for the rigorous training and all the fundraising end it all in September with a grueling trek through the diverse terrain of our province. When Cops for Cancer stops here, they are always very grateful for the great lunch but are also extremely happy to talk to citizens that give up a couple of hours of their time to come out and cheer these wonderful men and women on. We all have a couple of weeks to perhaps think of a fundraiser to help these first responders to reach their goals. The impact of cancer on a child's life...and their family....is overwhelming. Please give generously. If not your money, then please give your time to this worthy cause! February 18th, 2019 - It's a wonderful holiday to celebrate FAMILIES!! Be sure to come out with the kids, cousins, grandparents, aunts and uncles and have a fun-filled day at Canyon Lanes! Best of all it's FREE! Join us at Almer Carlson Outdoor Pool this year for a community picnic to celebrate our nation's 151st birthday starting at 12 noon when we will sing O' Canada and raise the flag. You can bring your own lunch and lawn chairs if you like. Or you can buy a hot dog and drink for only $5. The North Bend Hall will be open for serving & seating if you need to get out of the sun! Everyone will get a free Canada Day Cupcake, thanks to "Celebrate Canada" funding from the Department of Canadian Heritage. Everybody gets to swim for free on Canada Day too! 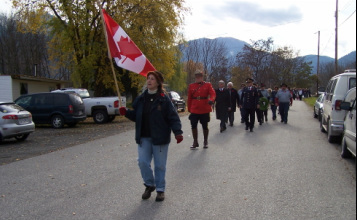 Our community began holding an annual Remembrance Day service in 2008. We asked for advice from the Legions in Hope and Lytton on proper protocol. The Lytton Legion donated some wreaths to use for our first service, and the Clinton Legion has donated an additional four crosses and seven wreaths. Community volunteers provide refreshments after the event. 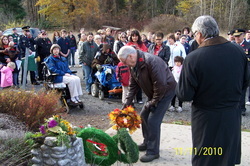 Members of the community recite the poem “In Flanders Fields” and the reply to “In Flanders Fields”. They also support the event with purchases of the poppy and cedar wreaths made locally by Kathy Walters. We have on display a permanent honour roll of all the men and women who served in the military in our community. 10:45 a.m. Parade to the Cenotaph memorial site. Refreshments to follow in the North Bend Community Hall. Boston Bar continues to amaze with the amount of food and cash donations that go to our local Food Bank. So much hard work goes into this event to make it a success every year. RCMP Officers use their own time to organize and attend the event and the public is always so supportive of their efforts. On December 2nd, 2017, our Boston Bar RCMP members Phil, Darren and Robert collected approximately 800 lbs. of food and received over $3,000.00 in cash donations and vouchers. What a wonderfully successful annual event this has turned out to be! And a very heartfelt THANKS goes to our very generous community!